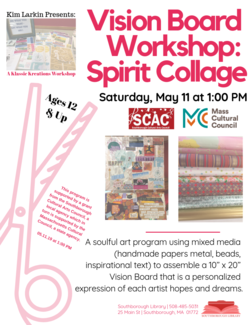 Please join us on Saturday, May 11 at 1:00 PM for a Vision Board Workshop: Spirit Collage. This is soulful art program using mixed media (handmade papers metal, beads, inspirational text) to assemble a 10’’ x 20’’ Vision Board that is a personalized expression of each artist hopes and dreams. This program is supported by a grant from the Southborough Cultural Arts Council, a local agency which in turn is supported by the Massachusetts Cultural Council, a state agency. For Ages 12 & Up.